Every entry in the original live-action Teenage Mutant Ninja Turtles films managed to get even sillier than the last. Teenage Mutant Ninja Turtles II: The Secret of the Ooze was toned down from the first film and saw the turtles not even use their trademark weapons once. Teenage Mutant Ninja Turtles III saw them travel back in time to feudal Japan, because why not? Not long after the third film opened did pre-production begin on a fourth movie, which would have been titled Teenage Mutant Ninja Turtles: The Next Mutation. Series creators Kevin Eastman and Peter Laird began working on ideas for the film, which would have seen the four turtles and their rat “master,” Splinter, given additional superpowers as a result of their initial mutations, presenting them with new problems as well. Donatello was to be given telekinetic and telepathic abilities, which, as Laird wrote in his blog, “would have been counterpointed by diminishing eyesight (hence the vision-enhancing goggles).” Leonardo was given an upgraded “Rising Sun” bandana in addition to the mutant power of changing his skin to an “impenetrable chrome-like surface.” Michelangelo was given the ability to project a human look onto himself, allowing him the ability to interact with regular people on the street, as a result his outfit was changed to give him more human like clothes. Raphael would be able to transform into what they were calling “Raptor Raph,” a nasty version of the character with “big gnashy teeth and claws to complement his big gnashy personality.” Splinter would also transform into a muscular version of himself as the pair wanted to integrate him into the fights the turtles would take part in. 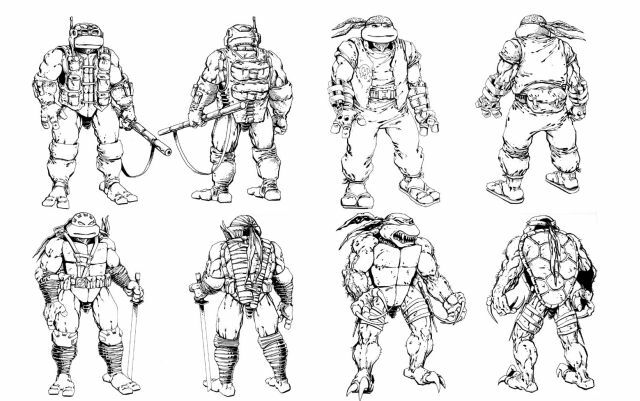 Concept art for the film, which debuted at auction in 2012, revealed even more characters conceived for the film, including a new version of the Super Shredder, an evil version of April, a new villain called Spyder, and a fifth turtle named Kirby, after famed comic book artist Jack Kirby. The film was scraped but the title, and idea of a fifth turtle, were reused for a short-lived, live-action series.